The Power of the Mass if for you! It is the sacrifice of sacrifices, because it is the sacrifice of God for US. There is NO better activity that anyone in the entire world can do than attend a Mass in the state of grace, and receive Jesus in the Eucharist. Like the Blessed Virgin Mary, we become living tabernacles of God after Communion! Through time and space, we connect with the original Last Supper (the Church does not re-sacrifice Jesus at each mass; rather, each Mass is a re-creation of the original Mass). You can have an intention for each Mass that you attend (resolution of a family matter, health problem, etc., and you can have intentions for the prayers of the faithful. You can also have the Mass said for a particular intention by calling the Parish Secretary and having the Priest announce the intention at the Mass. Why? Because of the spiritual benefits that occur at the Mass. In the "Our Father" prayer, we pray to "give us this day our DAILY bread", and the Catholic Church fulfills this with Daily Masses. This correlates exactly to Acts 2:46, where the Apostles met daily for the breaking of the bread. So take advantage of all of these spiritual blessings for YOU by attending as many daily Masses as possible. When you meet Jesus face to face, the number of Masses you attended while alive will plead loudly for your salvation! What are the purposes for which the Mass is offered? First, to adore God as our Creator and Lord. Second, to thank God for His many favors. Third, to ask God to bestow His blessings on all men. Fourth, to satisfy the justice of God for the sins committed against Him. 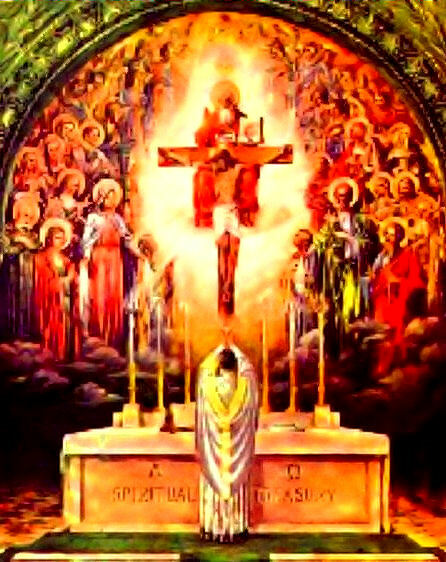 In holy Mass, in obedience to Christ's command, "Do this in remembrance of me," we of the Church offer perfect praise to the heavenly Father, and sanctify ourselves and the world by the power that flows from the priestly office of our eternal High Priest, Jesus Christ. The benefits of even one holy Mass are infinite and include the whole world. The blood of the new and everlasting covenant was "shed for you and for all." In every Mass that is offered the Church remembers before God "those who take part in this offering, those here present and all your people, and all who seek you with a sincere heart." In a special way those who have holy Mass offered and those for whom a Mass is offered partake of the grace of the Eucharistic sacrifice. The Church which offers Mass each day includes not only the faithful on earth, but the saints in heaven, as well as the suffering souls still awaiting entrance into heaven. It is a pious and praiseworthy custom for the faithful to have Masses offered for their particular intentions, and especially for departed friends and loved ones. It is a laudable Catholic practice when requesting Mass for a special intention to make an offering both for the support of the priest who will celebrate the Mass and to provide for the needs of the altar as well as the materials required for the holy Sacrifice. It is very sad that so many non-Catholic Christians consider the Mass to be an abomination. It is just the opposite. 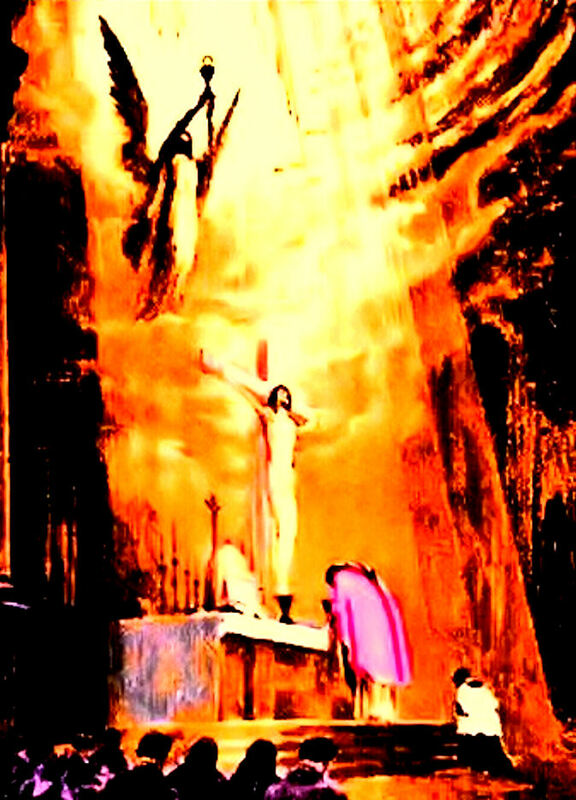 It is the one-time sacrifice of Jesus on the Cross recreated, through time and space, in an unbloody fashion, just like Jesus did during the Last Supper. The Mass is the most perfect form of prayer! (revelation of Christ to St. Gertrude the great). A single Mass offered for oneself during life may be worth more than a thousand celebrated for the same intention after death. "If someone said to us, "At such an hour a dead person is to be raised to life, " we should run very quickly to see it. But is not the Consecration, which changes bread and wine into the Body and Blood of God, a much greater miracle than to raise a dead person to life? We ought always to devote at least a quarter of an hour to preparing ourselves to hear Mass well; we ought to annihilate ourselves before God, after the example of His profound annihilation in the Sacrament of the Eucharist; and we should make our examination of conscience, for we must be in a state of grace to be able to assist properly at Mass. If we knew the value of the holy Sacrifice of the Mass, or rather if we had faith, we should be much more zealous to assist at it." One Mass before death may be more profitable than many after it. "The Holy Mass would be of greater profit if people had it offered in their lifetime, rather than having it celebrated for the relief of their souls after death"
"The Blessed Virgin Mary once told Her faithful servant Alain: "My Son so loves those who assist at the Holy Sacrifice of the Mass that, if it were necessary He would die for them as many times as they've heard Masses." "It would be easier for the world to survive without the sun than to do without Holy Mass." "The Mass is infinite like Jesus. . .Ask an angel what the Mass is, and he will reply to you in truth,"I understand what it is and why it is offered, but I do not, however, understand how much value it has." One angel, a thousand angels, all of Heaven know this and think like this." "If we only knew how God regards this Sacrifice, we would risk our lives to be present at a single Mass." "Renew your faith by attending Holy Mass. Keep your mind focused on the mystery that is unfolding before your eyes. In your mind's eye transport yourself to Calvary and meditate on the Victim who offers Himself to Divine Justice, paying the price of your redemption." "Every Holy Mass, heard with devotion, produces in our souls marvelous effects, abundant spiritual and material graces which we ourselves, do not know." "The heavens open and multitudes of angels come to assist in the Holy Sacrifice of the Mass." "The angels surround and help the priest when he is celebrating Mass."